This list is just a start for some of the most common materials needed for DIY Babywearing. None of these sources are guaranteed, and this isn't a comprehensive list. This is simply a list of suggestions from the members of our Facebook group . Feel free to join if you have a question about a specific material, or have suggestions for more sources! 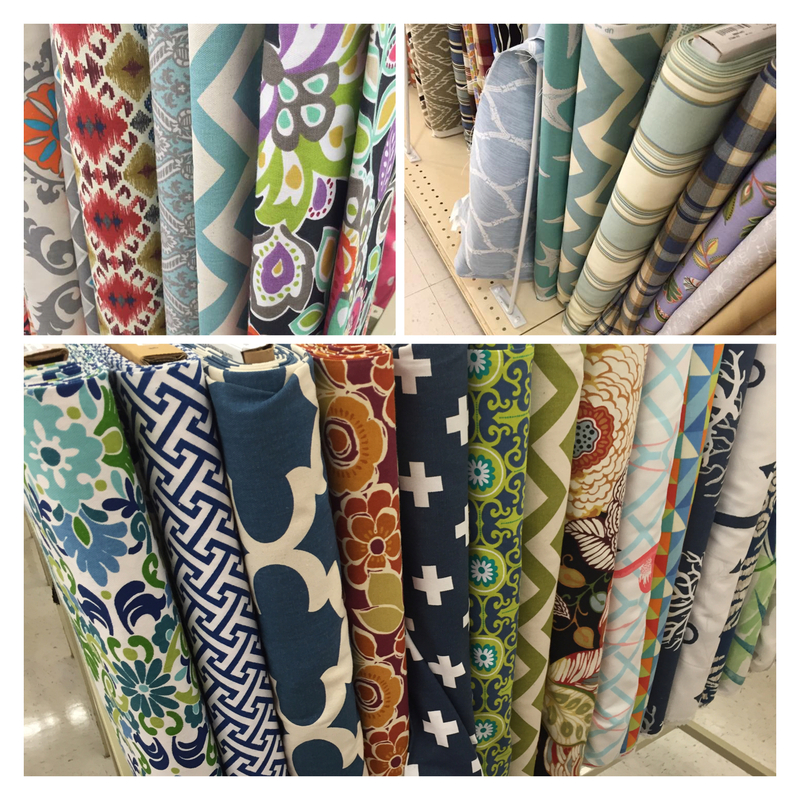 As always, before buying any fabric, make sure it passes the Four Rules of Fabric Selection! Please do your own independent research to ensure that all of the materials you are buying are safe and from a legitimate source. We do our best, but we cannot guarantee any of these sources. Osnaburg is a natural-colored, bottomweight muslin-like fabric. It is highly recommended for beginners because of the low cost and excellent wrap qualities once broken in. It works great for wraps and ring slings and breaths nearly as well as linen. Because osnaburg doesn't come in a lot of varieties, it is almost always an excellent choice, and the bolt tags are always clearly labled (although sometimes hard to find.) The only thing to look out for is "J Thompson" brand osnaburg, which has a reputation for being much thinner than other brands and less desireable. Roc-lon is the brand most people use and love. Although "traditional" osnaburg is made from linen, most of the osnaburg available in stores is 100% cotton. 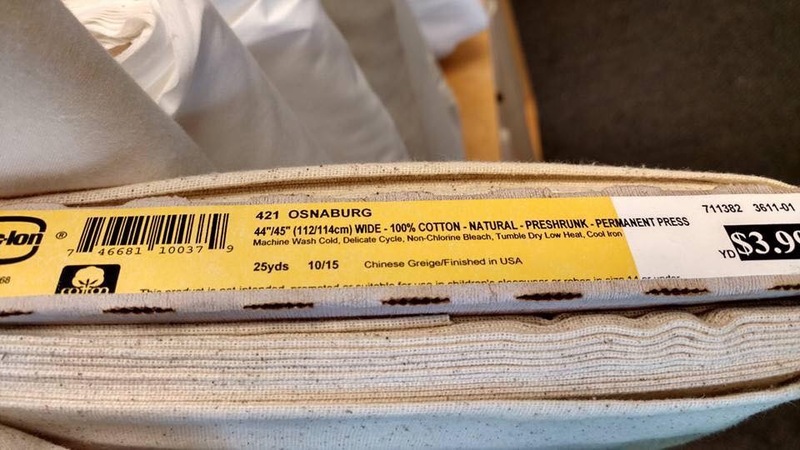 Because osnaburg is sold raw and unprocessed, it has a lot of "gunk" on it from the manufacturing process and it is recommended to scour the fabric before using it for your child. It is a fairly simple process but should not be skipped. Outside of the US, osnaburg can be insanely hard to find and sometimes very expensive. A decent alternative is heavyweight calico, but make sure you shop by feel since calico varies by weight. You want something sturdy enough that you could make pants out of. "Calico" outside of the US is a raw, sturdy, unfinished fabric that comes in varying weights, many of which are suitable for babywearing. However, in the US, "calico" refers to thin, printed quilter's cotton which is never safe to use for weightbearing purposes. Duck cloth is a 100% cotton fabric similar to canvas. It is a great choice because even very lightweight duck is heavy enough to be safe. Duck comes in a variety of weights, all the way up to 18oz per square yard (for purposes such as sandbags and hammocks) but most of the duck cloth sold in stores will be closer to the 5-7oz variety. Printed/patterned duck is typically closer to 5-6oz. Solid colored duck at most stores is usually sold as "duck canvas" and is stiffer and heavier (closer to 8oz), but will eventually break in to be usable. Since duck is often organized with or labeled as an upholstery fabric, always double check the fiber content and washability to ensure your fabric will make a good carrier. Avoid "wipe with a damp cloth" outdoor fabrics! Linen is an incredibly strong fiber derived from flax and the gold standard for breathability in the heat. It takes a little work to break it in and soften it and tends to crease a lot, but is generally a well recommended fabric for any project. When buying linen, always check the fiber content. A lot of "linen" sold in stores is "linen-like" fabric made from cotton or rayon or even polyester. True "linen" will say "100% linen" for the fiber content (or 100% flax, sometimes - linen is made from the flax plant.) This is not to be confused with "linens" such as bedsheets, which are not safe to use, or "table linens" like tablecloths, which can be safe to use but are another subject entirely. Avoid "tissue linen" that is far to thin to use for any weight bearing purposes. Colimaçon et Cie (C&C) is a French company that sells broken twill, solid colored, woven wrap material by the meter. Honeycomb Loom is a newer, similar company based out of the UK that sells woven wrap material by the meter as well. These are your best options for a DIY wrap or carrier that will feel exactly like a purpose-woven wrap, because it essentially is. It is also great for making soft structured carriers and meh dais that will feel like wrap conversions. Watch out for C&C's 30% off sales several times a year. Both companies sell 100% cotton fabric. C&C also offers cotton/silk and cotton/bamboo blends. Both companies sell and ship internationally. Tablecloths are a great budget option that are typically cheaper than fabric by the yard. A jacquard woven tablecloth will feel nearly identical to a woven wrap: nice and floppy, cushy and breathable. A printed tablecloth, so long as it is an appropriate thickness, will be similar to working with duck cloth. For more information, check out our whole page on Tablecloth Babywearing. Athletic mesh is a specialty sports fabric that can be used for water wraps and slings. The correct kind of mesh can be tricky to find. Make sure you are buying the right stuff. Not utility mesh, athletic knit, wicking mesh, etc. It should have clearly visibile yet small holes, stretch from selvedge to selvedge, no or minimal stretch lengthwise, and be 100% polyester or nylon. Sling rings are specialty-made rings made from nylon or aluminum to be used for ring slings, onbuhimos, and other carriers. While it is possible to find rings at a hardware store with proper weight rating and a smooth weld, these will likely be at least triple the weight of an equivalent aluminum sling ring and even a smooth weld can eventually wear a weak spot in your fabric. If at all possible, it is always preferable to use a ring that is designed for babywearing. NEVER use rings purchased from a craft store as these are NOT designed to bear weight. If you need to source locally, check cloth diaper boutiques, or ask in your local mom's group or babywearing group. Webbing, ladder locks, and buckles for SSCs should always be weight tested well above the weight they will be holding! The general rule of thumb is to use buckles and webbing tested to a MINIMUM of double the weight you would ever want to carry. So a toddler/preschool carrier that you would want rated up to 50lbs should use buckles rated to a MINIMUM of 100lbs. If a website or package does not list the weight rating, try e-mailing the company; some may offer you some guidance, even if they don't advertise their weight rating. In general, camping/outdoors stores are a good place to check for quality materials. "Open cell foam" is the light, squishy type of foam often found it craft or fabrics stores that is used for chair cushions. "Closed cell foam" is dense and rubbery, like yoga mat or anti fatigue mats. Many people also use layers of fleece or even cotton batting for padding. For more information, check out this article by Sewtoot.